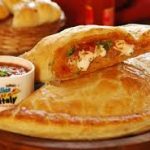 This Calzone recipe comes from my Italian high school buddy. His mother used to make these Calzones all the time and I made sure I was there when she did! They are really good! Fillings are up to you....here are a few suggestions, take your pick: Cheese, mushrooms, green pepper, onion, sausage, pepperoni, ham, bacon, chicken, olives, tomatoes, spinach, jalepen!os, garlic, anchovies, hot dogs or anything else that is tasty in a calzone! Some warm water for crimping. Pour 1 cup warm water into small bowl; stir in the sugar and yeast. Let stand until yeast dissolves, about 5 minutes. It should show some sign of bubbling. Mix 2 tbsp. oil, 1 tsp. salt, 2 cups of flour. Mix together till smooth, knead and cover for 30 min. Roll out dough in about a 10" circle. Place 1 cup of sauce in the center of the dough and spread it around, then place the cheese (if using) on top of that. Layer on the ingredients you have chosen, you can stack them just high enough that the dough will be able to fold over. Fold the dough over and brush the edges with the water and crimp the edges together making a decorative seal. Place on a greased cookie sheet and place in oven. About 5 minutes before it is done, brush with melted butter (this makes a delicious difference). Cook for a total of 25 - 30 minutes or until golden brown. You can halve the recipe to make 2 small-medium calzones. The fillings can be made with anything you wish, your only hindered by your own imagination. This makes an awesome pizza crust too!